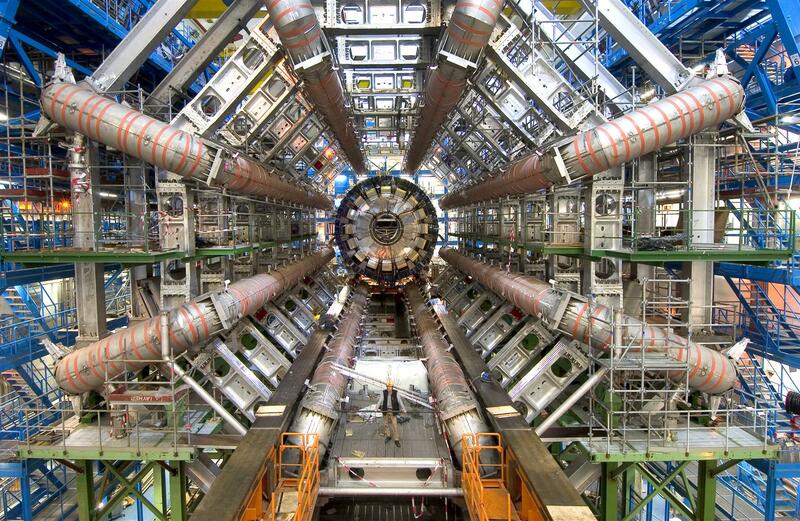 A search through antiquity to understand the ancient science magick behind CERN. Outside the CERN facility in Geneva, Switzerland, stands an idol of the Hindu deity Shiva, the “Destroyer”, or who we know from Greco-Roman myth as Kronos/Saturn. The deity was a god of both light and darkness; called Osiris in Egypt, his brother Set merely representing Osiris’ dark side—two aspects of a single being. The same pattern of light/dark duality is found in the Zoroastrian deities Ahura-mazda and Angra Mainyu; and in Sanskrit writings, Vishnu and Shiva. It was also put forth by the 20th-century scholar Immanuel Velikovsky that the planet Saturn used to be a sun, then declined from solar status sometime in ancient history, thus the myths of Osiris becoming Lord of the underworld, and Kronos being cast into Tartarus—a sun-god becoming an underworld god. The planet Saturn remains the furthest from the sun of the seven classical planets, thus it represents darkness. This fall from heavenly status is eerily similar to the Judeo-Christian scriptures about Lucifer becoming Satan, light becoming dark. Note that Saturn was the god of time, often called “Old Father Time”. This equates him with the sun-god because the Sun is the principal timepiece of our world. 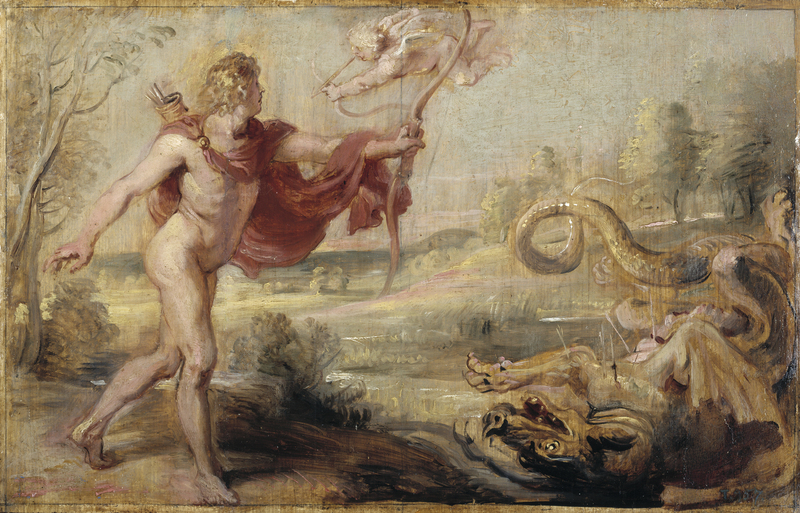 Apollo is the same sun-god, depicted as fighting a giant serpent called “Python”, or “Typhon”—the Nordic myth of Thor slaying the Midgard Serpent—a personification of the perpetual battle between day and night. This is yet another false apotheosis of the dual nature of Lucifer/Satan. Lucifer is Apollo, Satan is the Serpent, but both are the same entity, like playing each side of the chessboard. This effectively pronounces the Christian Devil as God in the pagan perspective, which is who the apostate Israelites in Canaan worshipped as “El”, or “Baal/Moloch”. An so he has, but only in the minds of the deceived. The serpent god Ophel and the sun-god Apollon were often worshipped in the same temples, being two faces of the same personage. The two were unified as “Ophion”, from “Ophis” (serpent) and “On” (an epithet for the Egyptian sun-god). Incidentally, the early Ethiopians worshipped the serpent, hence the derivation of the name Aethiopia: from Ath (a sacred title) and Ophis (serpent), literally rendering the name of these people “the serpent-breed” after the god that they worshipped. The first “Ophites”, as they were known, descended from Cuth, father of the Babylonian king Nimrod, and they first settled under the title of “Heliadae” at the Greek island of Rhodes, which consequently came to be known as “Ophiusa” because of their notable worship of the serpent. Other titles that this Cuthite lineage prevailed under are Ophionians, Aethiopes, Elopians, Oropians, and perhaps more familiarly, Europians (Europe), all of which denoted “the people of the serpent”. Incidentally, CERN is located in Europe. 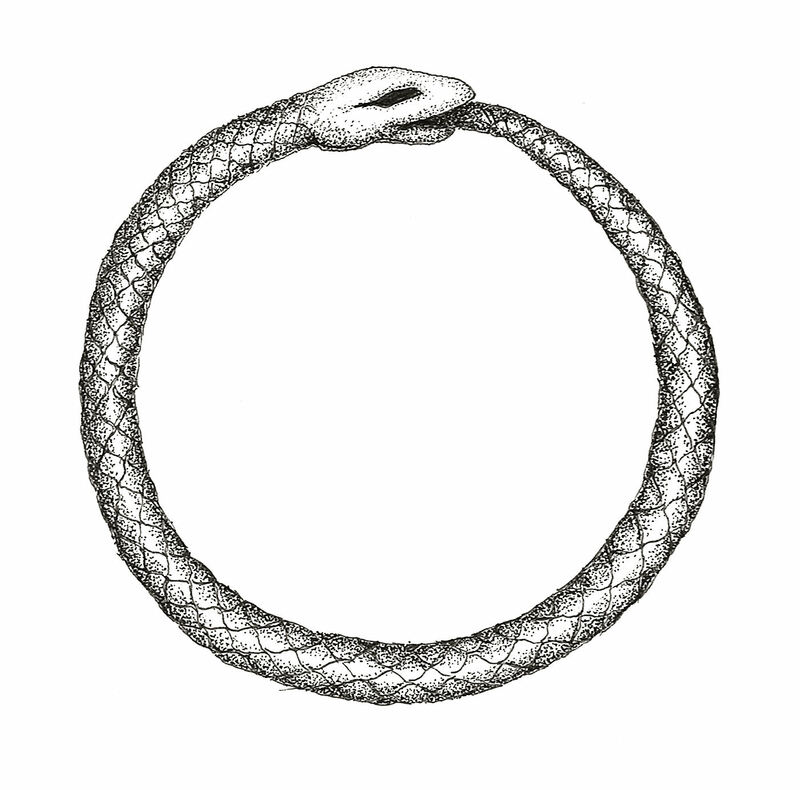 The organization appears to venerate the Greek concept of Ouroboros—a serpent swallowing its own tail—as the circuit of the Large Hadron Collider forms the same shape of a gargantuan ring. The ring has always been a symbol of the god Saturn, even before the planet’s rings were discovered by telescope, and is part of what strongly associates Saturn with the ouroboric serpent that encircles it. For this reason, the ring is invariably used in practical summoning rites of Thelemic magick as a portal to invoke spiritual entities. Saturn is equated with the number 6, being the 6th planet from the Sun. Historically, the god was symbolized by the hexagram, called the Seal of Solomon, mistaken today for the “Star of David”, which is essentially a 6-sided hexagon surrounded by 6 triangles, the whole shape drawn with 6 lines; hence, 666. Each of the 6 triangles also have equal angles of 60 degrees (60°, 60°, 60°). The black cube is also a symbol for Saturn, hallowed by Muslims as the Kaaba in Mecca, who worship the Akkadian “Bel” as Allah, who is the Canaanite “Baal”, who is Osiris/Kronos/Saturn, the imposter “God”. The symbol of the cube is associated with the Earth element in Plato’s ‘Timaeus’—consider that Capricornus, the astrological domain ruled by the planet Saturn, is also an Earth sign. The cube is also a 6-sided shape, again equating Saturn with the number 6; and a cube seen from one of its vertices forms the 2-dimensional shaped of a hexagon, which is also the shape seen in the rotating storm clouds on the planet Saturn’s north pole during NASA’s Cassini mission. A devout Thelemite follower of Crowley, Kenneth Grant, said that beyond the cube lies the world of Okbish the Spider Queen, the world of those who “knew the mysteries of the awful alignments and made the connections with ions and made the lines meet that should not meet”. The eight spider legs of Grant’s “Okbish” equates in the Kemetic system to the eight-rayed star of Sirius, the dog. But, the idea of a dog, “canis”, is a corruption of the word “Cahen”, a universal term in ancient times for divinity, which the Egyptians applied as “Cahen Sehour” to the brightest star in their hemisphere, the Sun, as “Sehor” was “the great lord of Day”. “Cahen Sehour” was later misconstrued by the Greeks as “Canis Sirius”. This mistaking the solar deity for a dog was purely translative. As “Cahen/Cohen” signified divinity, the title came to denote a priest; thus, when the historian Diodorus says that the grand celebration of Isis was preceded by dogs, it was more likely to have actually been the priests of the goddess. The name “Osiris” was indeed a compound of the Egyptian “Sehor”, so Canis Sirius (Cahen Sehour) was actually the sun-god. The Babylonian sun-god Shamash (Saturn) was also depicted with eight rays, just like Sirius, representing the annual wheel of equinoctial and solstitial motions. Knowing this, is could easily be seen that Kenneth Grant’s “Okbish” is the same star as that of Osiris/Saturn/Shiva, which bears the mystery of unlocking the spiritual realm. Also, Grant’s reference to this higher realm being accessed by making “lines meet that should not meet” is an obvious allusion to solving the riddle of converging more than three perpendicular lines with a 4th dimension. Perceiving possibilities beyond those defined by Euclidian geometry, Albert Einstein put forward the “variable curvature from place to place” theory, which suggested that there is no such thing as a straight line, seeing lines as waves, rather. This theory makes the impossible seem possible—more than three lines meeting at a single point. This is what takes place in black holes. The variable curvature of the universe is Peh; Peh therefore represents the distortion that makes the transition from the 3rd to the 4th dimension seem possible, enabling more than 3 dimensions to meet at a perpendicular angle. That meeting takes places at the end of Peh, that is, beyond the 270 degrees of the cube’s corner, where consciousness is said to become the witness of non-being. “Okbish” is, in fact, an anagram for “kibosh”, which means “to prevent from happening”. In short, worshippers of Satan are seeking to “kibosh” God’s infallible plans by accessing the dimension of Shiva/Saturn. This 4th dimension is said to be accessed in the practice of Kundalini, where the “secret serpent power” said to be coiled at the base of the spine is elevated up the body to the cranial chakra, where the pineal gland is then opened. The opening of Peh (the mouth) is also the opening of Ayin, the Eye of Set, or Shiva, whose sight is in Ain (or “ajna”). 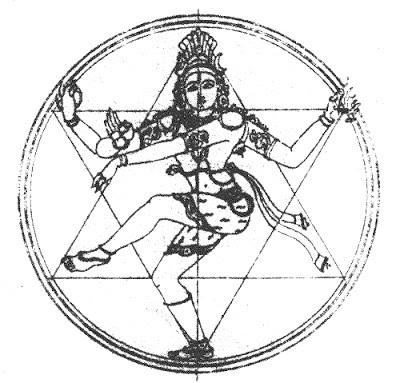 The opening of the Eye of Shiva is symbolized by the unfolding of the tetrahedron, a 3-dimensional hexagram. This unfolded, blossomed eye is called the “Sri Yantra” and is said to be the gateway to Daath (“knowledge”, equated with the Abyss/bottomless pit, said to be the domain of Shiva/Apollyon the Destroyer in the Book of Revelation). 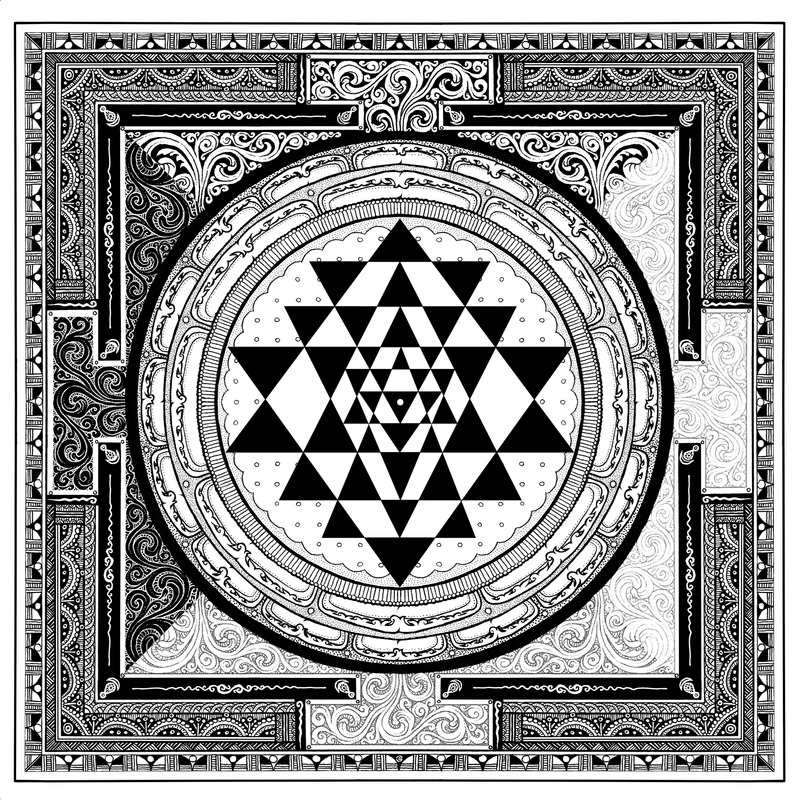 As the opened mouth, or eye, the Sri Yantra is the turning point between the 3rd and 4th dimensions of the universe. Having learned this symbolism, let’s scrutinize the CERN organization. The very name is a diminutive form of “Cernunnos”, the Celtic identity of Saturn, called the “horned god”, from the ancient Semitic “qrn”, meaning “horn”; hence, “Kronos”. This deity was also the Greek “Pan”, a horned he-goat god of the Golden Age, gold representing the Sun, the time when Pan/Lucifer was a shining sun before he became Saturn/Satan. 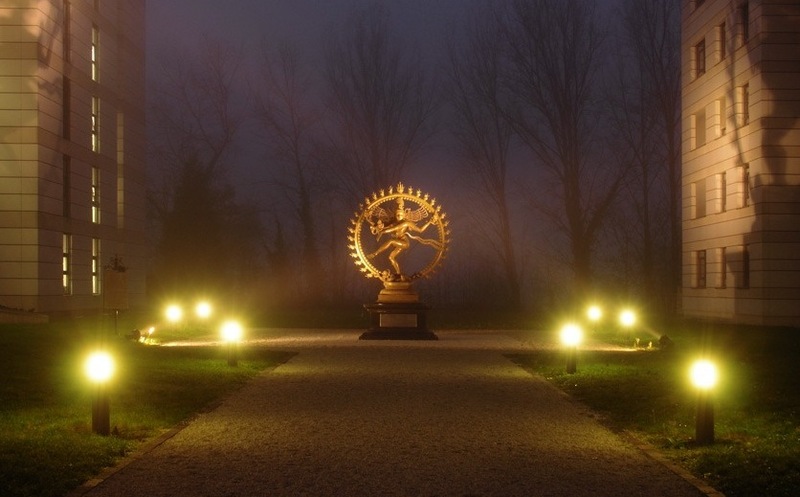 In addition to the statue of Shiva sitting right outside the CERN facility, the organization filmed a dance opera called “Symmetry” based on the “Nataraja”, Shiva’s cosmic dance of destruction, culturally a Hindu method to ritualistically invoke the spirit of Shiva; or in Biblical terms, open the bottomless pit of Apollion. The ouroboric ring symbol of Apollion/Saturn is also represented by the 27-kilometre-round circuit of the LHC particle collider—again, a highlight on the number 27 (Peh), the key to overcoming spiritual obstacles through warfare against God. Furthermore, the land on which the LHC sits is Saint-Genis-Pouilly, the name Pouilly deriving from the Latin “Appolliacum”, signifying the town as having once had a temple dedicated in Roman times to the sun-god Apollon, called in Hebrew “Abaddon”, from “abadir” and “On”, meaning “serpent sun-god”. I think it’s also worth noting that the logo for CERN is a disguised “666”. Back to Einstein’s “variable curvature” theory, I should note that his concept of a wavy line is a serpentine reflection of the “great serpent” of myth, a manifestation of the fallen angel Satan. This wavy line is known in mathematics as “sine”; and spiritually, it represents a curvature in God’s perfect creation, or what we know as “sin”, which is also the common abbreviation of “sine”. The trigonometric sine function is commonly used to model periodic phenomena such as sound and light waves, and it can be traced back to the Gupta period of Indian astronomy. Interestingly, light and sound are the two influences that stars have on our world, that is, that all we receive of stars are their light waves and sound frequencies. This could possibly explain Satan’s influence of sin as originating from a stellar source, perhaps the planet Saturn. Consider how creation was perfect when God first made it — “And God saw every thing that he had made, and, behold, it was very good” (Genesis 1:31). In this perfection, there was no death; Adam and Eve were immortal. Thus, time (Kronos) only entered into Adam and Eve when they sinned, thereby producing death —“For the wages of sin is death” (Romans 6:23). From this, we can conclude the unholy trinity: sin = time = death. All three are continuous with each other, and all three were introduced simultaneously — “but you must not eat from the tree of the knowledge of good and evil, for when you eat from it you will certainly die” (Genesis 2:17). Saturn is called the god of “time”, effectively connecting him with the elements of sin and death, hence his alternate role in mythology as lord of the underworld; aka Apollion, Osiris, Shiva, etc… So, if Apollo/Horus the sun-god and Python/Apep the evil serpent are in fact two sides of the dual-natured pagan deity, then Saturn is in fact the same as the serpent in the Garden of Eden, the satanic form that is fallen Lucifer, who influenced Eve through his words and appearance (sound and light), establishing in the first humans sin, time, and death. I would submit that light and sound continue to be Satan’s most popular devices for temptation in our world today, seeing as these two elements have the greatest impact in shaping the human mind—what we see and hear (i.e., the entertainment industry). Eve was tempted also by the notion that the fruit was “desirable for gaining wisdom” (Gen 3:6). She then gave the fruit to Adam, and consequently, “the eyes of both of them were opened, and they realized they were naked” (Gen 3:7). The connection between having “opened eyes” and a suddenly heightened level of self-consciousness is indicative of the Sri Yatra, the blossomed “third eye” of Shiva. I might reference Catholicism, as well as the Eastern and ancient religions, noting their affinity for the pinecone symbol, which represents the pineal gland, or third eye. It’s thought of as a point of passage between the 3rd and 4th dimensions, that is, our realm and the spiritual realm. Astonishingly, this is exactly the same ambition that the scientists at CERN admit to be working towards—on a much grander scale. With all the Saturnian religious symbolism in place, the invocatory ritual dance of Shiva complete, the search for the 4th dimension by way of an 8-billion-euro particle collider seems to be guided by ambitions of more than a scientific nature. If I didn’t know any better, I’d say the world was prepping for Armageddon. “ATLAS”, one of the LHC’s particle accelerators. Its eight toroid magnet barrel loops are reminiscent of the eight points of a tesseract (4-dimensional hyper-cube), as well as the eight rays of Sirius (Osiris), or the Egyptian and Babylonian sun-star. Brother, I think your right on; but don’t let this stuff consume you. The time is short that we have available to study the Bible to show ourselves approved. (2 tim 2:15) We’re definitely going to want to have the word stored away in hearts/minds to access/meditate on when tribulation comes. Also as much as possible we should be focusing on our personal relationship with God through quiet time/prayer as well as reaching the lost, and teaching the babes in Christ. This is the great commission. Figuring out how we can be used by God for his glory, and what matters the most now while we still have a chance to serve our great King. We must think in terms of eternity. What will God say to us when we stand in front of him in that great and terrible day to be judged when he determines our eternal reward? and what about the eternal future of our fellow man perishing all around us? Remember, everything that is not built upon “the rock,” aka Christ Jesus will be burnt up. God bless you and keep you my friend. Will be keeping you in prayer. how long have you studied the ‘Saturn phenomenon”? I’ve recently woken up to this, as it is literally referenced EVERYWHERE, in the media, movies, you name it. There are several people on youtube for example that dig into this and I tend to only pay attention to ones that bring Christ into the picture. This also relates to the significance of 3,6,9. I am trying to learn as much about this as I possibly can….such as Saturn being some type of machine; not mechanical in the sense but something as what you’ve already eluded to. Hi Kieland, I’ve also sent you an email on this, coming into financial hardship I discovered the sri yantra and have been (uknowingly) doing the chants, miraculously enough to my surprise been mispronouncing them for 2 months!! or more! miracle, because of this article and (my inner feelings) I am now back on the right path, PLEASE continue to right this is necessary and important and ABSOLUTELY brilliant work! I live in Vancouver, Canada, and the Eastern cultural influence is quite intense in the ultra-hip yoga-matting frappuccino-drinking yuppie demographic. But, in matters of darkness and light, this is not merely a cultural difference; this is a matter of true religion and false religion, and if you have the discernment to see that the Hindu tantric teachings are literally inspired by the adversary of God, then you have been greatly gifted with that truth by the Father. Hearing about someone like you——a rarity in today’s world——is inspiring to me, because all I see every day is a world enamoured by the Devil whilst only seeing his cunning mask of light, not his true face. The 33 million gods of Hinduism are the legions of demons and their leaders. I’ll write another article to explore the foundational philosophy that motivates and links all false religions. The penned term is “continuity”, as opposed to “transcendence”–that is to say that we believe in a God who is transcendent of His creation, not a God that is “continuous” with his creation. Check out this short article for a brief intro… http://www.reasons.org/articles/the-worldview-of-continuity Fascinating study! This is the basis behind the Eastern religions, which effectively deifies man and woman as being emanations of a divine masculine and feminine cosmic force——Satan again convincing us that we’re divine. Sorry for the late reply. Over the last year, I began to research Saturn in classical antiquity, mythology, and studying from a solid Christian foundation the evil religion of theosophy, which comparatively equates Saturn with Shiva, and other deities from various religions. Satanists know the identity of Satan better than most people. I’m not sure about this “Saturn machine”, although I have heard the term before. Saturn was the same entity as Kronos, Pan, Shiva, Shani, Moloch, Osiris and his brother Set, Typhon, Quetzalcoatl, Kukulkan, Ningishzida, and Allah (AKA: “Ishtaran”, also “Dumuzi”, or “Allat”). The list goes on, and on, and on. The pagan mystery is that the sun-god was one in the same with the serpent-god, which is why the ancient ophites (snake-worshippers) worshipped the serpent-god in the same temples as the sun-god. Apollo (light) and Python (darkness) were depicted as fighting, but they were a representation of the same dark-and-light dual-natured deity, who we know was Lucifer/Satan (light/dark). Let me recommend a brilliant book on classical antiquity that I was enthralled with. It’s called “A New System: an Analysis of Antient Mythology”, written by English scholar Jacob Bryant in 1807. Read this book with the link below and you’ll be a genius on these matters. It’s good to be aware of these things, but as a follower of Christ, I must exhort my brothers and sisters in Christ to spend a small fraction of time looking at this information, and the rest of the time revelling in the joy of salvational theology. We are simply too close to the end, and to Jesus, to be focusing on the Devil. By the way, feel free to friend me on Facebook. I always like to invite my Christian family into my circle. And that goes for anyone who sees this. Find me under “Kieland Shea Edmonds”! Ciao. I am humbled and grateful to have had a friend post this which came across my page. Thank you. Anyone who is in the Spirit of Christ feels the time that is upon us. I am as I say, way inspired everyday. I was born under extreme circumstances and had many of the same throughout life and have known I would be here now. I fell disabled in late 2001 I believe from Cesium poisoning courtesy of G.E. The doctors can give me no diagnosis for my disability but have but 40% heart function. There are many “evil” frightening images in the skies worldwide which cannot be seen by anyone without them feeling the same. I have one of two sons still living losing one on Thanksgiving Day 2012 to the CIA’s black projects programs, their importing of the Heroin into this country. I am aged at 59 and have always been a firm believer since birth. Michael my still living son, is a “budding” Astrophysicist and I couldn’t be happier he found purpose. He like most Science based thinkers as well as losing his older brother, has stepped out of the standing you have to be in to move forward. I will share this article to him as I believe he can grasp the true meaning. Thank you for your hard work, and your Courage to publish your findings. It is very refreshing in a world that is so lacking of it today. Hi Duane I had lost faith(not surprising after even our local Church’s Minister had been divorced from his wife and his faith and joined the Turtle Clan(which I have not studied much yet but if I have to guess I’d say it’s Pagan) )and was very interested in Astrophysics, Quantum Mechanics/Physics, so I studied them for years(and years) and was disturbed when I had truly opened my two eyes to the lies of today and the various connections to CERN, the occult and Satan. I then realized I was brainwashed through the brilliance of mainstream. Even pictures I would draw were full of symbolism I had not even realized were completely Satanic.